You are here: Home » Guest Writers » Liverpool Preview + Lineups and all the Transfer Reaction! Posted by: supreetkini on September 1, 2012 in Guest Writers, Match Previews, Transfers Comments Off on Liverpool Preview + Lineups and all the Transfer Reaction! The transfer window has been well closed for over half a day, but yet you can feel the tremors created by it. And by tremors I mean, the ones that can actually result in a really massive earthquake. And these tremors refer to the voices of the disgruntled Arsenal supporters at the moment. Almost every other blog or page in Facebook I turn into, there is enough rant to turn Millwall fans cold. There are plenty of blogs venting their frustrations at Arsene Wenger and the board, at not having strengthened the squad sufficiently. And, to some extent I agree with them, and some I do not. The plain fact is we can name only 25 players in our squad this season, and the very crux of the problem lies in moving on players we don’t need, to fit in new players. The club tried but in vain to move on all the deadwood, and managed to get the likes of Vela, Bendtner and Park all out, but yet didn’t achieve the same with Chamakh, Squillaci and probably Arshavin, which meant we couldn’t force any more transfers even if we wanted to. While the manager did promise us, or kind of he did, that he would be bringing in more reinforcements before the end of the transfer window, the intent was pretty clear, when we were so close to snapping up Sahin on loan. Even Kevin Mirallas had been in ‘advanced’ talks with the club, but both ended up going to Merseyside. Another striker and a defensive minded midfielder looked to be on the agenda of Arsene Wenger. And with deadline day approaching, there were rumors that Arsenal’s negotiators were spotted in Germany and Spain, and the club was expecting to announce atleast 2 major signings before the end of the day, 1 on loan and 1 on a permanent basis. Afellay, linked to us all summer, joined Schalke, and rumors of the Gunners trying to secure a loan deal for Chelsea reject Michael Essien started rising. Yohan Cabaye too was thrown into the mix, but there was nothing on the German and Spanish fronts. Probably, they were on holiday. Anyways, as hours passed, the only players we were strongly linked to all day were Essien and the Newcastle midfield duo of Yohan Cabaye and Cheik Tiote. Supposedly, Arsene didn’t find the really top top player that he was looking for, which means our transfer summary would read we sold our two best players from last season, loaned out a few youngsters (7) and a couple of peripheral strikers, sold a few players who couldn’t make the cut (8), and bought in only 3 international players, all of whom are unproven at Premier League level. While these are still early days and the 2 games are hardly anything to go by, it would be foolish to say that the squad is capable of winning anything this season. Yes, there is enough quality in there, and some real good quality from back to front, but our squad has been ever changing over the past few years. Very few from our squad 4 years back remain at the club today. Nasri, Fabregas, van Persie, Clichy, Song, the very core of the team has moved on, and we are left with a team, that can be best dubbed as ‘transitional’. And this is what peeves me to a huge extent. And we are talking about one of the richest football clubs in the world, the 5th biggest club in terms of value, and yet we are witness to transfer windows where the balancing of chequebooks has become more important than the balancing of the squads. We are forced to seek loan moves for players from other top clubs, and this does disgust me a bit. Why in the world are we linked with a loan move for a player who can’t even sniff around the first team at Chelsea/Real Madrid? Don’t we want to be on par with them, and even better than them? Now, let me make it very clear and tell that I have nothing against Arsene Wenger, because he is the manager of the club, and he knows what’s in the best interests of the clubs. Maybe all this rant now could actually deliver us some trophies in a few years time, and make us the most financially sound club in the world. But, we never know, because anything in football can change in a matter of moments. Games, careers and even loyalties. To add to the frustrations, our rivals have been doing quite a lot of spending over the previous couple of days. Manchester City, so quiet all summer,with only Rodwell in the bag, signed Benfica’s defensive midfielder Javi Garcia, marauding Inter Milan right-back Maicon, Swansea winger Scott Sinclair and exchanged Montenegro defender Stefan Savic with Serbian defender Matija Nastasic with Fiorentina. Freak, even Queen’s Park Rangers have been making some astounding signings. Poor man’s Manchester City have signed players like Esteban Granero (ignore the fact he can’t make the Real Madrid team), Marseille defender Stephane M’bia and an absolutely international class goalkeeper in Inter’s Julio Cesar. The vibes from the other half of North London too haven’t been the most comforting. I always rated Moussa Dembele very highly. Here was a player, who could link up defence and attack so well, a perfect midfield player. Yet, despite some early reported interest, it all died down, and he is now at Sp*rs. Clint Dempsey was an absolute steal at £6 million, and there were plenty of flutters when we couldn’t even cough up that for a player who has proved it time and time again with a mediocre Premier League club. Football isn’t about who is better and who is not, but it is about fitting the best players into the best possible system you can construct for your team. And, I still believe in Arsene, and his policy and his work. I do feel our best 11 players are match for any other club across the league, yet I do know and everyone out there does that we still aren’t the strongest squad, and surely some way from challenging for top honours. To view Chamakh angling on after 81 minutes when we are trailing to some lower side in a midweek league fixture could be a common sight this season. And that’s because he is our only forward option on the bench. A player who has scored one goal in nearly 2 years. Overall, I am quite content with the squad at the moment. For starters, there aren’t any big headed ego’s because they have all been sold on. You may argue the point of Lukas Podolski but I am sure he feels happy and content to finally playing for a top club where he is valued. At Bayern, he was an irregular at best and never given the time and importance to shine. From back to front, I can find leaders all over the pitch. Thomas Vermaelen is a natural leader, and Mertesacker, Koscielny, Arteta, Podolski, Rosicky and might I say Arshavin, are all experienced and level headed enough for a club like ours. So, what they need at the moment is a bit of backing up and vociferous support. We all know it could be a hard and arduous season, but there are plenty of things to look forward to, with Wilshere, Rosicky and Sagna returning to full fitness in a month’s time. Hopefully, Arshavin will find the willingness to work hard, and be atleast half the player he was when he joined. I am also looking forward to seeing Francis Coquelin in defensive midfield. All in all, it doesn’t look bad. Meanwhile, the Champions League draws for the group stages were announced, and we have been handed a tricky group. We will be facing French champions Montpellier, former club of striker Olivier Giroud; Greek powerhouse Olympiakos again and German side Schalke. It could be one of the closest fought groups we have been in the past few seasons. The draw hasn’t been so kind on Manchester City who will face Spanish champions Real Madrid, Dutch champions Ajax Amsterdam and German champions Borussia Dortmund, in the ‘group of champions’. Chelsea and Manchester United have been handed ‘moderate to tough’ groups. The former got Shakhthar, Juventus and Nordsja..something. United got Braga, Galatasaray and CFR Cluj. The Rumbelows, Littlewoods, Milk, Worthington, Carling Cup, which has again been rebranded as the Capitol One Cup too has seen its draws being done. Arsenal will face Coventry City at home. There are some games to look forward to. Manchester United host Newcastle, while Liverpool face a dreaded trip to the Hawthorns. Team news then. Laurent Koscielny is fit and ready to play his first game of the season, while Wojciech Szczesny will face a late fitness test, though he is expected to sit out this one as caution. Liverpool will welcome back Daniel Agger after his suspension, and he will replace Sebastien Coates. With Lucas out injured, we could see Nuri Sahin make his debut for the Reds, and there will also be place for exciting youngster Raheem Sterling. 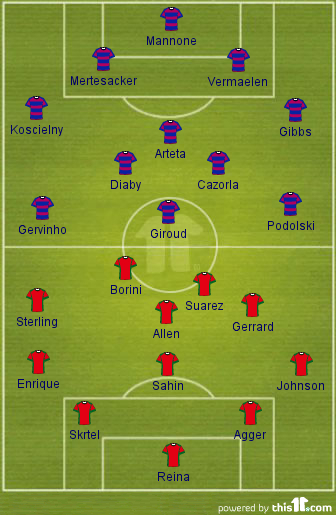 This is how I can see the two teams lining up. I have tried to understand what Liverpool are trying to do with their new system under Rodgers, but I do not completely understand it yet. They do not have any outstanding wide players, but play the pacy Sterling on the wing. He is a real menace with his pace, and he does a lot of switching, so will be hard to mark. Gerrard has shied a bit from his usual central role, to a mixed one between centre and right. I expect Sahin to start in midfield, but I wouldn’t be too surprised if Jonjo Shelvey was to be given a start. Up front Suarez can be a real threat, and Arsenal’s defence have to be alert at all times. Borini’s role too has been questionable, with the striker not really looking like an out and out striker or a forward who drops deep. I feel he will be asked to do a specific task tomorrow and that is to catch out Arsenal’s defence on the break as much as possible. I would love to see Koscielny start at right-back instead of Jenkinson. For the simple fact that Jenkinson may not be able to handle the pace of Sterling. Koscielny did play at right-back a couple of times last season, and what we saw was him usually drifting inwards, to form a 3 centre-back system, which did serve the purpose quite efficiently. Up front, I have the feeling we are set for a big game from Cazorla because he will find a lot more space than he did last week. Again, I want Chamberlain to start, instead of Walcott and Gervinho, who so far have been unconvincing for me. Giroud will battle with Skrtel and Agger, another exciting duel. I do not expect this game to be too tactical. In fact, we could witness an open flowing game. Arsenal have allowed only 10 shots on target against them, the best number in the league, yet have created too many opportunities and not taken them. Liverpool were the better side against Manchester City last week, yet were the reason for their own capitulation, as they split points with the champions. So, enjoy the game wherever you are. Before I end, a word of appreciation for Radamel Falcao. He was brilliant yesterday as Atletico Madrid humbled Chelsea 4-1 in Monaco in the European Supercup game. What a big-game player. Wish we sign him next sea..oh well!